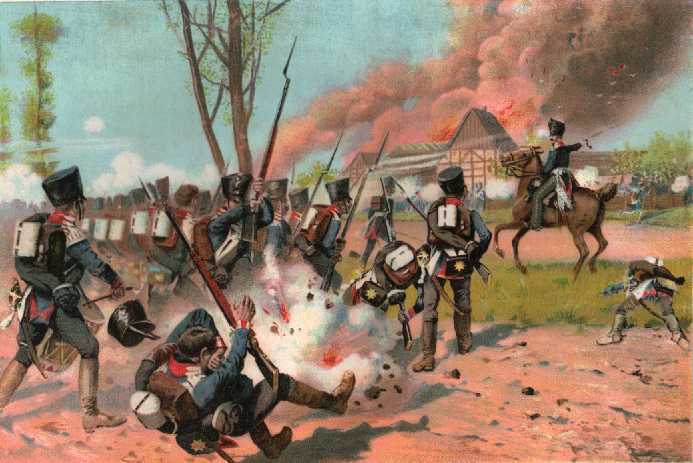 Prussian Foot Guards at Gross-Goerschen, 1813 (click to enlarge). Knoetel print - author's collection. 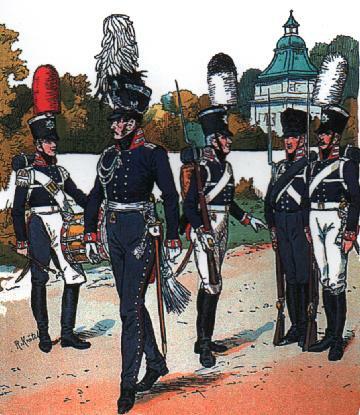 In 1806, the Prussian Foot Guards were numbered in the line (Regt no. 15). However, the Foot Guards Regiment was removed from the line in 1813 and renamed the 1st Foot Guards Regiment. A 2nd Foot Guards Regiment was raised in the same year. The Prussian Foot Guards did not take part in the Waterloo campaign. The two Foot Guards Regiments were organised in the same manner as the line regiments - 2 Musketeer battalions and 1 Fusilier (Light) battalion. Each battalion consisted of 4 companies. Total battalion strength was around 800 officers and men. Uniforms were similar to those of the line infantry. A black shako with a white band around the top, dark blue coat and grey pants (campaign dress). Equipment straps were white for the Musketeers and black for the Fusiliers. The 1st Regiment had the following distinctions - poppy red collar, cuffs and turnbacks, 2 strips of white lace on collars and cuffs. Shoulder straps were white. 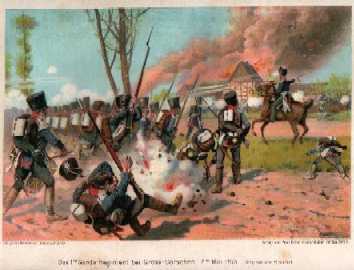 The 2nd Regiment was raised with the "Normal" infantry battalion (a drill demonstration unit formed in 1811) as its core. It therefore retained their old uniform which was as follows - poppy red collar, shoulder straps, cuffs and turnbacks. 2 strips of white lace on collar (none on cuffs). There was a dark blue cuff flap on each cuff. Knoetel print showing the uniform of the 1st Foot Guard Regiment. The 4th figure from the left is dressed in campaign dress. The other figures are in parade dress (tall plumes and white breeches). Knoetel print courtesy of Uniformology.